For applications and consequences of the law, see Electromagnetic induction. Faraday's law of induction (briefly, Faraday's law) is a basic law of electromagnetism predicting how a magnetic field will interact with an electric circuit to produce an electromotive force (EMF)—a phenomenon called electromagnetic induction. It is the fundamental operating principle of transformers, inductors, and many types of electrical motors, generators and solenoids. The Maxwell–Faraday equation (listed as one of Maxwell's equations) describes the fact that a spatially varying (and also possibly time-varying, depending on how a magnetic field varies in time) electric field always accompanies a time-varying magnetic field, while Faraday's law states that there is EMF (electromotive force, defined as electromagnetic work done on a unit charge when it has traveled one round of a conductive loop) on the conductive loop when the magnetic flux through the surface enclosed by the loop varies in time. Historically, Faraday's law had been discovered and one aspect of it (transformer EMF) was formulated as the Maxwell–Faraday equation later. Interestingly, the equation of Faraday's law can be derived by the Maxwell–Faraday equation (describing transformer EMF) and the Lorentz force (describing motional EMF). The integral form of the Maxwell–Faraday equation describes only the transformer EMF, while the equation of Faraday's law describes both the transformer EMF and the motional EMF. A diagram of Faraday's iron ring apparatus. The changing magnetic flux of the left coil induces a current in the right coil. 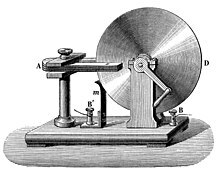 Faraday's disk, the first electric generator, a type of homopolar generator. Michael Faraday explained electromagnetic induction using a concept he called lines of force. However, scientists at the time widely rejected his theoretical ideas, mainly because they were not formulated mathematically. :510 An exception was James Clerk Maxwell, who in 1861–62 used Faraday's ideas as the basis of his quantitative electromagnetic theory. :510 In Maxwell's papers, the time-varying aspect of electromagnetic induction is expressed as a differential equation which Oliver Heaviside referred to as Faraday's law even though it is different from the original version of Faraday's law, and does not describe motional EMF. Heaviside's version (see Maxwell–Faraday equation below) is the form recognized today in the group of equations known as Maxwell's equations. Lenz's law, formulated by Emil Lenz in 1834, describes "flux through the circuit", and gives the direction of the induced EMF and current resulting from electromagnetic induction (elaborated upon in the examples below). Faraday's experiment showing induction between coils of wire: The liquid battery (right) provides a current which flows through the small coil (A), creating a magnetic field. When the coils are stationary, no current is induced. But when the small coil is moved in or out of the large coil (B), the magnetic flux through the large coil changes, inducing a current which is detected by the galvanometer (G). The electromotive force around a closed path is equal to the negative of the time rate of change of the magnetic flux enclosed by the path. The closed path here is, in fact, conductive. The definition of surface integral relies on splitting the surface Σ into small surface elements. Each element is associated with a vector dA of magnitude equal to the area of the element and with direction normal to the element and pointing "outward" (with respect to the orientation of the surface). where dA is an element of surface area of the moving surface Σ(t), B is the magnetic field, and B·dA is a vector dot product representing the element of flux through dA. In more visual terms, the magnetic flux through the wire loop is proportional to the number of magnetic flux lines that pass through the loop. When the flux changes—because B changes, or because the wire loop is moved or deformed, or both—Faraday's law of induction says that the wire loop acquires an EMF, E, defined as the energy available from a unit charge that has travelled once around the wire loop. (Note that different textbooks may give different definitions. The set of equations used throughout the text was chosen to be compatible with the special relativity theory.) Equivalently, it is the voltage that would be measured by cutting the wire to create an open circuit, and attaching a voltmeter to the leads. is the electromotive force (EMF) and ΦB is the magnetic flux. The direction of the electromotive force is given by Lenz's law. The laws of induction of electric currents in mathematical form was established by Franz Ernst Neumann in 1845. Faraday's law contains the information about the relationships between both the magnitudes and the directions of its variables. However, the relationships between the directions are not explicit; they are hidden in the mathematical formula. A Left Hand Rule for Faraday's Law. The sign of ΔΦB, the change in flux, is found based on the relationship between the magnetic field B, the area of the loop A, and the normal n to that area, as represented by the fingers of the left hand. If ΔΦB is positive, the direction of the EMF is the same as that of the curved fingers (yellow arrowheads). If ΔΦB is negative, the direction of the EMF is against the arrowheads. Align the curved fingers of the left hand with the loop (yellow line). Stretch your thumb. 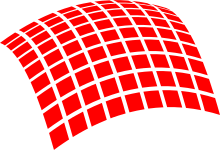 The stretched thumb indicates the direction of n (brown), the normal to the area enclosed by the loop. Find the sign of ΔΦB, the change in flux. Determine the initial and final fluxes (whose difference is ΔΦB) with respect to the normal n, as indicated by the stretched thumb. If the change in flux, ΔΦB, is positive, the curved fingers show the direction of the electromotive force (yellow arrowheads). If ΔΦB is negative, the direction of the electromotive force is opposite to the direction of the curved fingers (opposite to the yellow arrowheads). where N is the number of turns of wire and ΦB is the magnetic flux through a single loop. An illustration of the Kelvin–Stokes theorem with surface Σ, its boundary ∂Σ, and orientation n set by the right-hand rule. (in SI units) where ∇ × is the curl operator and again E(r, t) is the electric field and B(r, t) is the magnetic field. These fields can generally be functions of position r and time t.
E is the electric field, B is the magnetic field. dA is an infinitesimal vector element of surface Σ. If its direction is orthogonal to that surface patch, the magnitude is the area of an infinitesimal patch of surface. Both dl and dA have a sign ambiguity; to get the correct sign, the right-hand rule is used, as explained in the article Kelvin–Stokes theorem. For a planar surface Σ, a positive path element dl of curve ∂Σ is defined by the right-hand rule as one that points with the fingers of the right hand when the thumb points in the direction of the normal n to the surface Σ. The integral around ∂Σ is called a path integral or line integral. Notice that a nonzero path integral for E is different from the behavior of the electric field generated by charges. A charge-generated E-field can be expressed as the gradient of a scalar field that is a solution to Poisson's equation, and has a zero path integral. See gradient theorem. The integral equation is true for any path ∂Σ through space, and any surface Σ for which that path is a boundary. The surface integral at the right-hand side is the explicit expression for the magnetic flux ΦB through Σ. The four Maxwell's equations (including the Maxwell–Faraday equation), along with Lorentz force law, are a sufficient foundation to derive everything in classical electromagnetism. Therefore, it is possible to "prove" Faraday's law starting with these equations. The area swept out by a vector element dl of a loop ∂Σ in time dt when it has moved with velocity vl . where vl is the velocity of a part of the loop ∂Σ. where ∂Σ is the boundary (loop) of the surface Σ, and vl is the velocity of a part of the boundary. is EMF and v is the unit charge velocity. is for the motional EMF (due to the magnetic Lorentz force on charges by the motion or deformation of the loop in the magnetic field). It is tempting to generalize Faraday's law to state: If ∂Σ is any arbitrary closed loop in space whatsoever, then the total time derivative of magnetic flux through Σ equals the EMF around ∂Σ. This statement, however, is not always true and the reason is not just from the obvious reason that EMF is undefined in empty space when no conductor is present. As noted in the previous section, Faraday's law is not guaranteed to work unless the velocity of the abstract curve ∂Σ matches the actual velocity of the material conducting the electricity. The two examples illustrated below show that one often obtains incorrect results when the motion of ∂Σ is divorced from the motion of the material. Faraday's homopolar generator. 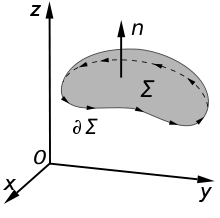 The disc rotates with angular rate ω, sweeping the conducting radius circularly in the static magnetic field B (which direction is along the disk surface normal). The magnetic Lorentz force v × B drives a current along the conducting radius to the conducting rim, and from there the circuit completes through the lower brush and the axle supporting the disc. This device generates an EMF and a current, although the shape of the "circuit" is constant and thus the flux through the circuit does not change with time. A wire (solid red lines) connects to two touching metal plates (silver) to form a circuit. The whole system sits in a uniform magnetic field, normal to the page. If the abstract path ∂Σ follows the primary path of current flow (marked in red), then the magnetic flux through this path changes dramatically as the plates are rotated, yet the EMF is almost zero. After Feynman Lectures on Physics Vol. II page 17-3.
where "it is very important to notice that (1) [vm] is the velocity of the conductor ... not the velocity of the path element dl and (2) in general, the partial derivative with respect to time cannot be moved outside the integral since the area is a function of time." Faraday's law is a single equation describing two different phenomena: the motional EMF generated by a magnetic force on a moving wire (see the Lorentz force), and the transformer EMF generated by an electric force due to a changing magnetic field (described by the Maxwell–Faraday equation). James Clerk Maxwell drew attention to this fact in his 1861 paper On Physical Lines of Force. In the latter half of Part II of that paper, Maxwell gives a separate physical explanation for each of the two phenomena. Yet in our explanation of the rule we have used two completely distinct laws for the two cases – v × B for "circuit moves" and ∇ × E = −∂tB for "field changes". We know of no other place in physics where such a simple and accurate general principle requires for its real understanding an analysis in terms of two different phenomena. It is known that Maxwell's electrodynamics—as usually understood at the present time—when applied to moving bodies, leads to asymmetries which do not appear to be inherent in the phenomena. Take, for example, the reciprocal electrodynamic action of a magnet and a conductor. The observable phenomenon here depends only on the relative motion of the conductor and the magnet, whereas the customary view draws a sharp distinction between the two cases in which either the one or the other of these bodies is in motion. For if the magnet is in motion and the conductor at rest, there arises in the neighbourhood of the magnet an electric field with a certain definite energy, producing a current at the places where parts of the conductor are situated. But if the magnet is stationary and the conductor in motion, no electric field arises in the neighbourhood of the magnet. In the conductor, however, we find an electromotive force, to which in itself there is no corresponding energy, but which gives rise—assuming equality of relative motion in the two cases discussed—to electric currents of the same path and intensity as those produced by the electric forces in the former case. Examples of this sort, together with unsuccessful attempts to discover any motion of the earth relative to the "light medium," suggest that the phenomena of electrodynamics as well as of mechanics possess no properties corresponding to the idea of absolute rest. ^ Sadiku, M. N. O. (2007). Elements of Electromagnetics (4th ed.). New York & Oxford: Oxford University Press. p. 386. ISBN 0-19-530048-3. ^ "Applications of electromagnetic induction". Boston University. 1999-07-22. ^ a b Giancoli, Douglas C. (1998). Physics: Principles with Applications (5th ed.). pp. 623–624. ^ Ulaby, Fawwaz (2007). Fundamentals of applied electromagnetics (5th ed.). Pearson:Prentice Hall. p. 255. ISBN 0-13-241326-4. ^ "Joseph Henry". Member Directory, National Academy of Sciences. Retrieved 2016-12-30. ^ Faraday, Michael; Day, P. (1999-02-01). The philosopher's tree: a selection of Michael Faraday's writings. CRC Press. p. 71. ISBN 978-0-7503-0570-9. Retrieved 28 August 2011. ^ Clerk Maxwell, James (1904). A Treatise on Electricity and Magnetism. 2 (3rd ed.). Oxford University Press. pp. 178–179, 189. ^ "Archives Biographies: Michael Faraday". The Institution of Engineering and Technology. ^ Lenz, Emil (1834). "Ueber die Bestimmung der Richtung der durch elektodynamische Vertheilung erregten galvanischen Ströme". Annalen der Physik und Chemie. 107 (31): 483–494. Bibcode:1834AnP...107..483L. doi:10.1002/andp.18341073103. A partial translation of the paper is available in Magie, W. M. (1963). A Source Book in Physics. Cambridge, MA: Harvard Press. pp. 511–513. ^ Poyser, Arthur William (1892). Magnetism and Electricity: A manual for students in advanced classes. London and New York: Longmans, Green, & Co. Fig. 248, p. 245. Retrieved 2009-08-06. ^ Jordan, Edward; Balmain, Keith G. (1968). Electromagnetic Waves and Radiating Systems (2nd ed.). Prentice-Hall. p. 100. Faraday's Law, which states that the electromotive force around a closed path is equal to the negative of the time rate of change of magnetic flux enclosed by the path. ^ Hayt, William (1989). Engineering Electromagnetics (5th ed.). McGraw-Hill. p. 312. ISBN 0-07-027406-1. The magnetic flux is that flux which passes through any and every surface whose perimeter is the closed path. ^ a b c d e Feynman, R. P. (2006). Leighton, R. B.; Sands, M. L. (eds.). The Feynman Lectures on Physics. San Francisco: Pearson/Addison-Wesley. Vol. II, p. 17-2. ISBN 0-8053-9049-9. "The flux rule" is the terminology that Feynman uses to refer to the law relating magnetic flux to EMF. ^ a b Griffiths, David J. (1999). Introduction to Electrodynamics (3rd ed.). Upper Saddle River, NJ: Prentice Hall. pp. 301–303. ISBN 0-13-805326-X. ^ Tipler; Mosca. Physics for Scientists and Engineers. p. 795. ^ Neumann, Franz Ernst (1846). "Allgemeine Gesetze der inducirten elektrischen Ströme" (PDF). Annalen der Physik. 143 (1): 31–44. Bibcode:1846AnP...143...31N. doi:10.1002/andp.18461430103. ^ a b Yehuda Salu (2014). "A Left Hand Rule for Faraday's Law". The Physics Teacher. 52: 48. Bibcode:2014PhTea..52...48S. doi:10.1119/1.4849156. ^ Salu, Yehuda. "A Left Hand Rule for Faraday's Law". www.PhysicsForArchitects.com/bypassing-lenzs-rule. Retrieved 30 July 2017. ^ Whelan, P. M.; Hodgeson, M. J. (1978). Essential Principles of Physics (2nd ed.). John Murray. ISBN 0-7195-3382-1. ^ Nave, Carl R. "Faraday's Law". HyperPhysics. Georgia State University. Retrieved 2011-08-29. ^ Harrington, Roger F. (2003). Introduction to electromagnetic engineering. Mineola, NY: Dover Publications. p. 56. ISBN 0-486-43241-6. ^ Note, Griffiths uses τ for volume elements. Griffiths, David J. (2015). Introduction to Electrodynamics (4th ed.). Pearson India Eduction Services. p. 321. ISBN 978-93-325-5044-5. ^ a b Davison, M. E. (1973). "A Simple Proof that the Lorentz Force, Law Implied Faraday's Law of Induction, when B is Time Independent". American Journal of Physics. 41 (5): 713. Bibcode:1973AmJPh..41..713D. doi:10.1119/1.1987339. ^ a b Krey; Owen. Basic Theoretical Physics: A Concise Overview. p. 155. ^ Simonyi, K. (1973). Theoretische Elektrotechnik (5th ed.). Berlin: VEB Deutscher Verlag der Wissenschaften. eq. 20, p. 47. ^ a b Stewart, Joseph V. Intermediate Electromagnetic Theory. p. 396. This example of Faraday's Law [the homopolar generator] makes it very clear that in the case of extended bodies care must be taken that the boundary used to determine the flux must not be stationary but must be moving with respect to the body. ^ a b Hughes, W. F.; Young, F. J. (1965). The Electromagnetodynamics of Fluid. John Wiley. Eq. (2.6–13) p. 53. ^ Clerk Maxwell, James (1861). "On physical lines of force". Philosophical Magazine. Taylor & Francis. 90: 11–23. doi:10.1080/1478643100365918. ^ Griffiths, David J. (1999). Introduction to Electrodynamics (3rd ed.). Upper Saddle River, NJ: Prentice Hall. pp. 301–3. ISBN 0-13-805326-X. Note that the law relating flux to EMF, which this article calls "Faraday's law", is referred to in Griffiths' terminology as the "universal flux rule". Griffiths uses the term "Faraday's law" to refer to what this article calls the "Maxwell–Faraday equation". So in fact, in the textbook, Griffiths' statement is about the "universal flux rule". ^ Einstein, Albert. "On the Electrodynamics of Moving Bodies" (PDF). Clerk Maxwell, James (1881). A treatise on electricity and magnetism, Vol. II. Oxford: Clarendon Press. ch. III, sec. 530, p. 178. ISBN 0-486-60637-6.